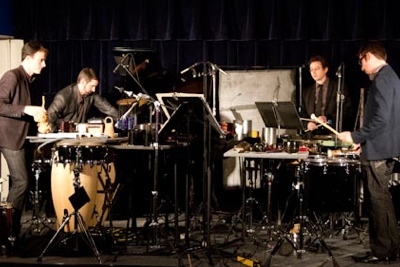 Chicago's Third Coast Percussion (Owen Clayton Condon, Robert Dillon, Peter Martin, and David Skidmore) opened our season in Club Sudakoff, playing works by John Cage and Steve Reich. 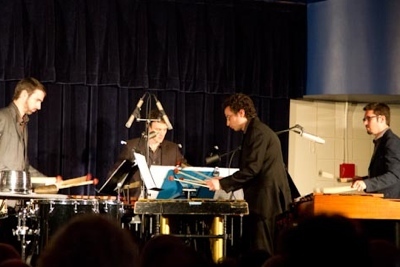 On a stage crammed with a prepared grand piano, two marimbas, two vibraphones, and hundreds of other percussion instruments large and small (including two tom-toms modified into "lion's roars" with wooden dowels protruding from their upper heads), the quartet began with Cage's Second Construction and then moved on to Reich's Mallet Quartet. Cage's Credo in US involved recorded sounds (here an iPod was used instead of a phonograph) and bursts from a radio tuned to a local station. 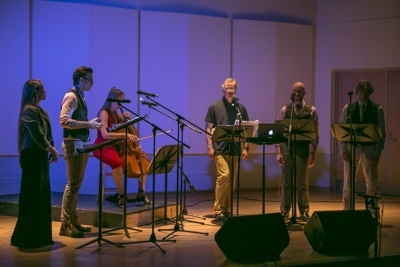 The radio motif continued as fifteen students from Professor Stephen Miles's Experimental Music class encircled the entire room and performed Cage's Radio Music. Reich's Nagoya Marimbas was a soothing yet intense way to set up the finale, Cage's raucous Third Construction, which rises to a fever pitch with the rhythmic blowing of a conch shell. 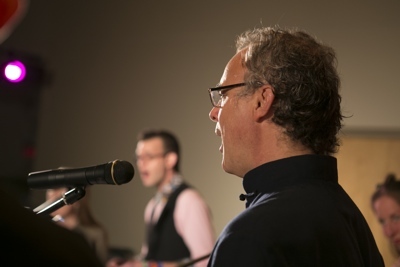 The public was invited to join students in Professor Stephen Miles's Experimental Music class for two workshops, Cornelius Cardew's The Great Learning, Paragraph Seven and selections from Pauline Oliveros's' Sonic Meditations. 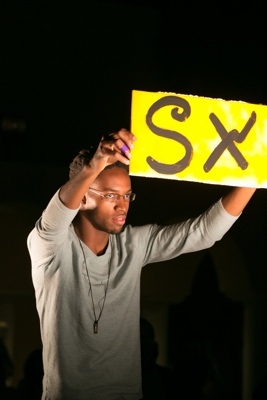 Attendees could participate in or simply observe these important experimental late-twentieth-century vocal works. 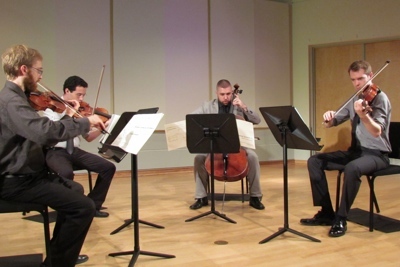 The phenomenal JACK Quartet (Kevin McFarland, Christopher Otto, John Pickford Richards, and Ari Streisfeld) made its fourth appearance at NMNC, this time to play works composed by New College alumni Alejandro Castaño, Jason Rosenberg, Sara Moone, and Taylor Briggs. The composers were present for the Artist Conversation and the concert, except for Rosenberg, who was in Switzerland at the time and provided a video introduction to his piece. Castaño's A Post-Apocalyptic Love Affair was written when he was a third-year student at New College. Rosenberg composed String Quartet No. 1 after he left New College, when he was studying at the University of Illinois at Urbana-Champaign; the piece was written for the Arditti String Quartet. JACK had actually workshopped a different movement of Moone's graphically notated Mandala Music (part of her senior project at New College) when they were last at NMNC. Briggs supplied two pieces—his String Quartet No. 2, written while he was a student here, and An Anatomy of Entropy, from his days at the University of Illinois at Urbana-Champaign. 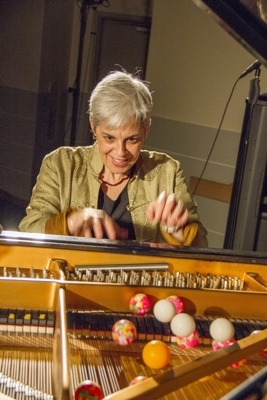 Canadian pianist Marilyn Lerner graced us with an unusual concert—an entire hour of improvisation. Her philosophical focus on being "in the moment" was clear as she continuously made choices about what she would play. 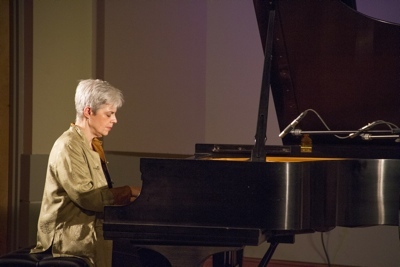 Besides masterful keyboard work, Lerner used extended techniques to explore the sonic possibilities of the traditional piano. She muted strings with her hand, "played" chords by holding down the dampers on certain keys while strumming all the strings, used the entire case of the piano for percussion, and allowed objects, such as glass and steel guitar slides and even ping-pong balls, to sit on the strings and vibrate or bounce as various keys were played. 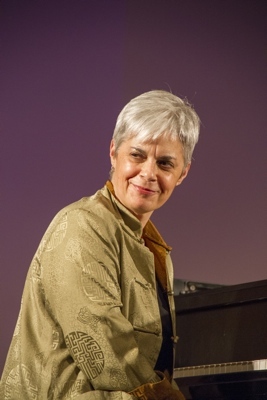 In addition to her concert and Artist Conversation, Lerner, who is a practicing psychotherapist, led a discussion on Psychoanalysis, Gender, and Jazz which was co-sponsored by the New College Gender Studies Program. 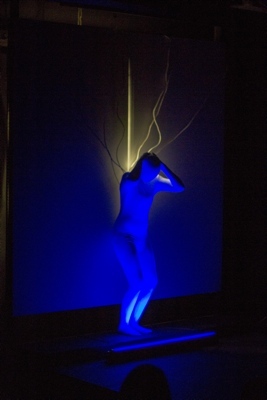 New College alum Erica Gressman returned to present her immersive sound and light interactive performance piece Wall of Skin in the Black Box Theater. First performed as part of her master's thesis at the School of the Art Institute of Chicago, the work involves movement, costume, homemade analog electronic instruments and lighting, and the demolition of a wall (it took almost a week and the labor of four people to build the structure inside the Black Box Theater). 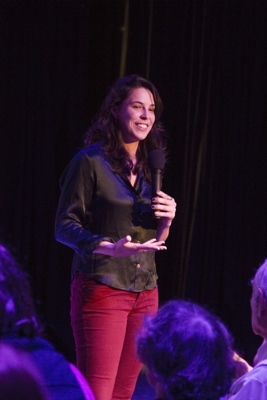 As the audience entered, Gressman was standing immobile, clad completely in layers of a "skin," which she removed one by one during the performance. Then, by pulling on cables attaching herself to the wall, she began rending the wall's surface, allowing light to shine through. 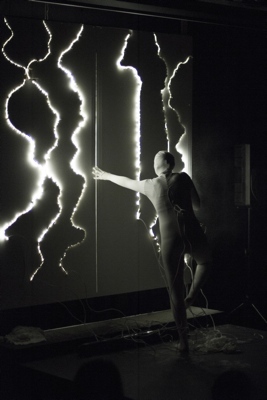 The light affected the pitch and volume of oscillator circuits she had built, creating a rumble of sound that reacted to her movements and to the state of the wall. She began tearing chunks off the wall, and eventually demolished the entire thing, as the sound rose in a crescendo. Finally, as she lay down, the piece ended dramatically with a sudden cessation of sound and light. After the performance Gressman discussed the piece with the audience and took questions. While she was at NMNC, Gressman also met with students to discuss artistic life after New College. 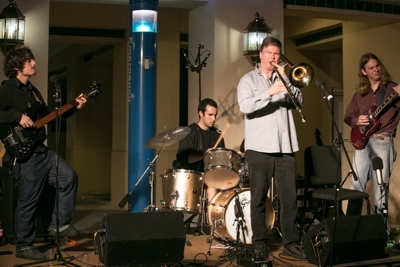 This season we continued our Crossroads concept of mixing different musical genres by investigating the intersection of bluegrass, the blues, and experimental music. Joining us were the bluegrass band Passerine (Carmela Pedicini, Tanya Radke, New College professor David Brain, alum Sara Moone, and student David Baker); blues/metal trio The Antiquarians (NCF students Nat Langston and Bill Kingdon and alum Ben Goodman); the Open Instrumentation Ensemble (all NCF students: Lili Wohl, Nasib McIntosh, Andrew Laird, Kevin McCombs, Jenny Wheeler, Ryan Smith, Brad Baker, and Dylan Burchett); trombonist/composer David Manson; Visiting Assistant Professor Mark Dancigers; and NMNC Technical Producer R. L. Silver. Passerine opened the evening on Stage 1, and Manson joined them for Heart & Mind. 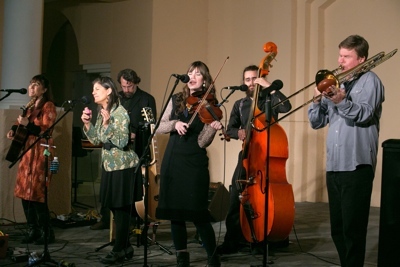 Then, at Stage 3 across the arcade, Langston played two solo pieces—Blues for Prepared Guitar and Analog Delay and the acoustic Broken Wagon Wheel—before the rest of the Antiquarians joined him for their set. Manson sat in on their Demon Door. 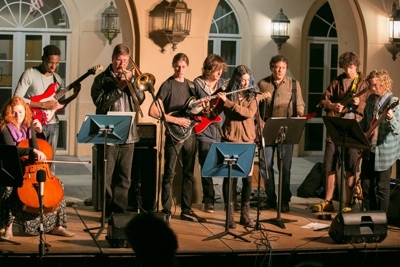 At Stage 2 the Open Instrumentation Ensemble played Silver's OIE Blues, with Silver joining on synthesizer and Manson subbing for Laird, who had a last-minute illness. Then Manson moved to Stage 1, where he performed the solo RE:DAVID, written by himself and Gustavo Matamoros, during which he triggered different recordings as he approached either of the two microphones on stage with his trombone. The evening concluded with the experimental musical tug-of-war Cobra by John Zorn, with players at all three stages directed by (and signalling to) prompter Nasib McIntosh at the center of the Arcade. 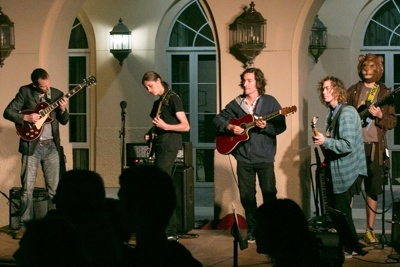 Dancigers played guitar at Stage 2, along with McCombs, Smith, Baker, and Burchett. The day before the concert we presented a panel discussion with New College professors Stephen Miles, David Brain, and Kariann Goldschmitt about the interaction between traditional genres and modernist and experimental ideas, complete with demonstrations by Nat Langston on guitar. 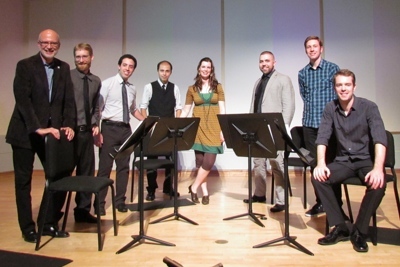 We closed our season with an incredible performance by Toby Twining Music, six vocalists—Eileen Clark, Eric Brenner, Malina Rauschenfels (who also played cello), Christopher Preston Thompson, Toby Twining, and Steven Hyrcelak—who combined classical technique with world and experimental sounds to create an amazing soundscape. 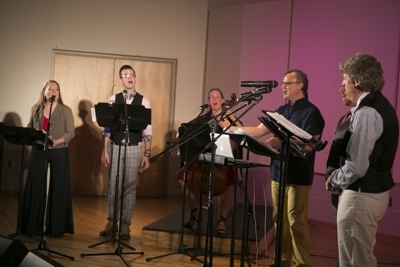 The concert began with a theatrical set of pieces, Incidental Music from Eurydice, which was written by Twining as part of Sarah Ruhl's Euridyce produced at the Wilma Theater in Philadelphia in 2008. 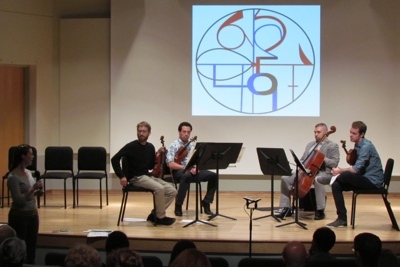 The meditative Schoenberg Dreaming, a solo for cello, provided a thoughtful pause, then the ensemble performed two works from a new project, Wandering (Wanderung), with text in both German and English translation from poems by Hermann Hesse. The final two pieces were the celebratory Yes! Yes! Yes! 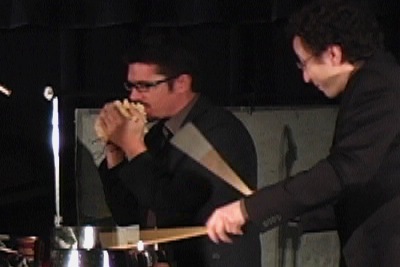 (from Eurydice) and Shaman, a percussive and entrancing piece from 1994.